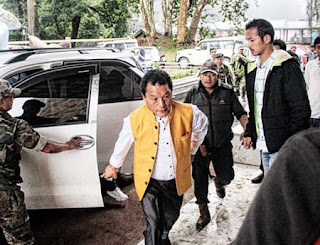 Chief of the Gorkhaland Territorial Administration (GTA) and the Gorkha Jan Mukti Morcha (GJMM), Bimal Gurung on Thursday said that the resignation of Harka Bahadur Chettri and Trilok Dewan from the GJMM is "nothing to be too sad about." He added that the duo did not turn out to his expectations. The GTA chief held a meeting with GJMM central committee members, municipality functionaries of the Darjeeling hills, representatives of GJMM frontal organizations, GTA executives after returning from Delhi on Thursday, to discuss the resignation of its two leaders and to chalk out future programmes. "The strategy that had been undertaken by us was for good. They failed to understand it. I will rather thank them for taking up a step like this at such a critical time," said Gurung while addressing media persons today. "Some announcements for which will be done in the public meeting in Kalimpong on 30 September," he added. It may be mentioned that recently the GJMM had asked three legislators from Darjeeling, Kurseong and Kalimpong to resign from the West Bengal State Legislative Assembly in protest of alleged interference on GTA subjects by the state government. Following this, two MLAs from Darjeeling (Dewan) and Kalimpong ( Chettri ) submitted their resignation from the party on 21 September. While Chettri retained his MLA post, Dewan resigned from the Legislative Assembly as well. They cited 'dictatorial policies' of the GJMM for taking the decision. Countering the allegations, the GTA chief said that he was never dictatorial and instead the duo took their decision without his 'permission'. Gurung added that the GJMM will provide them with a detailed report confirming no corruption in the GTA. According to Gurung, the decision by the rebel GJMM leaders is to some extent emotive as well. "Every party commits mistakes. But there lies no use in stretching small matters. Moreover, the party has not committed any grave mistake. In fact, we have been running GTA so well and bringing in so much development," he said.